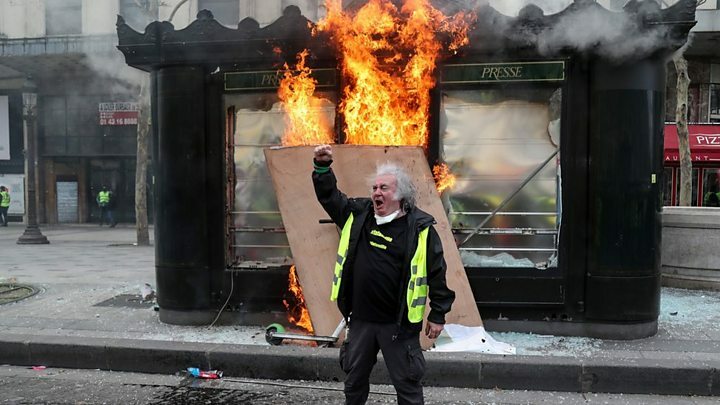 Demonstrators have smashed and looted shops in Paris in a resurgence of the gilets jaunes ("yellow vest") protests that started four months ago in France. Police say about 10,000 people took part in Saturday's protest in the French capital, a marked increase compared with similar demonstrations in recent weeks. Who are the 'gilets jaunes' protests? What's the latest from Paris? Fouquet's - an upscale restaurant popular with politicians and celebrities - was vandalised, as was a Boss menswear store. Mr Castaner said he had given police an order to respond to the "unacceptable attacks with the greatest firmness". Writing on Twitter, he said: "Let there be no doubt: they are looking for violence and are there to sow chaos in Paris." President Emmanuel Macron offered concessions to the protesters after the movement swept the nation - including €10bn (£8.5bn; $11bn) designed to boost the incomes of the poorest workers and pensioners - but they failed to quell the discontent. For the past month, Mr Macron has toured France, listening to local mayors and citizens as part of his "grand débat" - a big national debate. The 69-year-old academic told Le Parisien newspaper that he heard people shouting "dirty Zionist" and "throw yourself in the canal".